Bowers Gagemaker Products Help Keep the "Q" in "Q-Mass"
Given the many established subcontractors serving the demanding oil and gas industry, when Q-Mass commenced trading in 2006 it was clear that the new business needed to differentiate itself from the competition. To help reflect the ethos of the new venture, the fledgling company was named Q-Mass (Quality Manufacturing and Supply Solutions). Having enjoyed meteoric levels of growth since the company commenced trading, Q-Mass’ unwavering focus remains fixed on the delivery of consistently high-quality, added value components, on time and at a competitive price. From its inception, the company has continually invested in state-of the-art machine tools and employed a dedicated team of engineers and machine operators. This combination has resulted in Q-Mass becoming regarded as one of the most capable UK machine shops serving the Oil and Gas industry. Operating from an ultra modern 30,000 square feet manufacturing plant in Uddingston, Glasgow, much of Q-Mass' work is related to new product development, where the technology required by the Oil & Gas industry means increasingly complex designs need to be manufactured. These intricate parts often include complex geometries as well as difficult to measure internal and external threads with tight tolerances. To help guarantee the premium quality of manufactured components, methodical in-process inspection procedures are carried out throughout all production operations. As the company constantly strives to improve its in-process inspection methods, the recent investment in advanced thread measuring equipment from Bowers Group has not only improved Q-Mass’ measuring capability, it has also speeded-up component inspection throughput. Company co-owner, Ronnie Robertson explained: “Our policy of continuous improvement means that we are constantly looking for ways of improving our manufacturing systems, quality functions and speeding-up our component throughput. 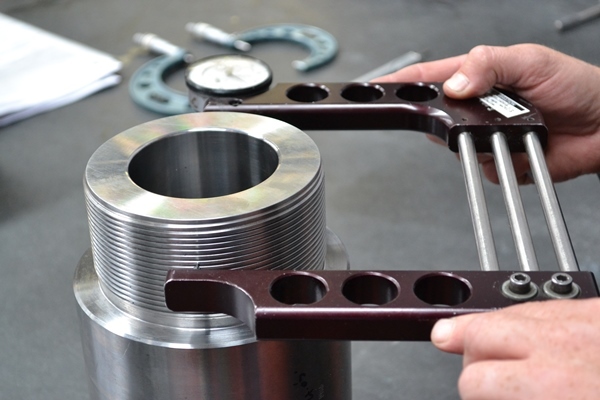 “As we produce an ever increasing amount of Oil & Gas Industry components featuring both external and internal threaded features, and given the expensive and dedicated nature of threaded plug and ring gauges, we recently substantially increased our array of Bowers Gagemaker thread measuring systems. “To enable the accurate measurement of threads, the ingenious Gagemaker kit uses interchangeable thread rolls to measure thread forms. To enable the thread gauges to be preset we use a Gagemaker MIC TRAC measurement centre. As a long time user of Gagemaker thread measuring systems we have found that they cost significantly less than solid gauges, whilst also delivering improved accuracy. “Now in constant use, we have obtained numerous advantages from using our Gagemaker equipment. Rather than employing relatively subjective go/no-go plug and ring gauges, our Gagemaker equipment provides accurate diameter readings, in addition we are also able to inspect the effects of thread element variations, such as lead, taper, thread height and pitch diameter. “Operating our thread gauges could not be easier; by opening our MIC TRAC measurement centre to the relevant size we can accurately set the thread gauges to the appropriate dimensions. Then by meshing the gauges’ thread rolls with the threads to be measured, we are able to quickly achieve very accurate measurements. Functional thread size gauges inspect the effects of all thread element variations and report deviations (functional size). Before inspecting parts, the gauges must be preset to a nominal predetermined dimension using gauge blocks, micrometers, or Gagemaker’s MIC TRAC measurement centre. The MIC TRAC, as used by Q-Mass, is an electronic, adjustable calibration and measurement centre that is able to inspect parts, preset indicator style gauges, and calibrate a variety of hand held inspection gauges. The MIC TRAC 3000 (MT-3000) is suited for use nearly anywhere, on a shop floor to a calibration lab. The high precision measurement system includes a base unit that houses a high precision optical and a digital readout (DRO) that displays measurement readings in inch or metric. Precision ground, matched sets of receiver pads, are used as parallel surfaces for the convenient mounting of the gauges that are to be set. For more information on the Gagemaker MIC TRAC click here.